BC05-RSCGH-K - Buddy Club Racing Spec Cam Gears - Pann Auto Performance - San Diego largest aftermarket automotive performance parts - What do you drive? 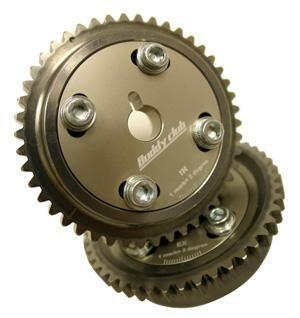 According to the racing experience, Buddy Club’s engineers developed the super lightweight duralumin cam pully today’s most popular engines. Lightweight duralumin was overly adopted as the material of both pulley part of an outer, and an inner plate portion to realize super-lightweight body. It is possible to change the engine’s output character by re-adjusting the closing timing of intake valve a below. By coating with hard almite on the surface, durability of the pulley have raised dramatically. It can easily be used for the drag racing cars that exceed 1000horse power and 10000RPM. With individual design of IN and EX, the adjustment part of both IN and EX pulley comes to its top when the engine’s TDC for easier valve timing adjustment.